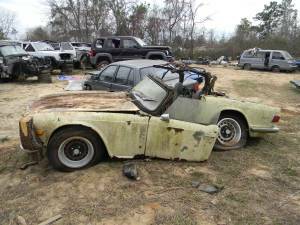 Hey look, a $500 TR6 in what the seller describes "overall good condition"! Oh hang on, it's collapsed under it's own weight and has a pine tree still stuck in the bumper. I've got to assume that the ad is typed in sarcasm font. But it's not the TR6 that's of prime interest here. Note the Diahatsu Charade 4-door in the back ground and the Toyovan parked way in back. Also note the Jeep Liberty with back end damage, perfect for making my own retaliatory knockoff of a Chinese product. UPDATE- I emailed the seller and he states that the car is in a junkyard and everything is for sale. The Daihatsu has no title and is lightly wrecked in the front but is likely salvageable.